Concern over high crime rates and deteriorating inner-city neighborhoods has reawakened interest in Defensible Space, architect Oscar Newman's groundbreaking physical design approach to crime prevention. 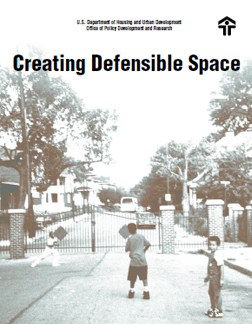 Creating Defensible Space, written by Newman and recently published by HUD's Office of Policy Development and Research, draws on Newman's experience carrying out and analyzing Defensible Space projects since the early 1970s. This publication provides an expert review of the Defensible Space concept and three step-by-step case studies to help communities redesign neighborhoods for greater safety. Defensible Space has been misinterpreted, and occasionally even misused, to justify design features that have merely fenced public housing or low-income residents in or out of particular areas. In fact, Defensible Space theory encompasses a wide range of planning and design strategies that focus attention on reassigning the perceived ownership of residential space. Newman argues that when common spaces associated with highrise housingsuch as community rooms and outdoor groundslack clear owners or are open to too many users, residents cannot assert responsibility for their safety and maintenance, and these places are left vulnerable to crime and vandalism. Newman advocates recreating a sense of ownership in these spaces by dividing and "assigning them to individuals and small groups to use and control as their own private areas." Once residents reestablish control of their environment, "the criminal is isolated because his turf is removed," writes Newman.